When there are water management concerns or interests that extend beyond one state or jurisdiction, governments may enter into formal intergovernmental agreements. These agreements between governments can be multilateral (between multiple state governments and the Commonwealth) or bilateral (between two states, or between one state and Commonwealth). Agreements may include the funding of water management programs, or projects to better understand water resources and the environment dependent on water resources. Intergovernmental agreements may also cover how benefits or responsibilities are shared between states or any other issues relating to water resources including flooding, groundwater, water sharing, and water and environmental degradation. Intergovernmental agencies may be established to oversee, study, or recommend water initiatives to share or protect common water resources. The Intergovernmental Agreement on Implementing Water Reform in the Murray Darling Basin June 2013 (revised March 2017) is an agreement between the Commonwealth and Basin state governments to ensure water reforms, including the Basin Plan, are implemented in a cost effective way to support national interest of improving river and wetland health, putting water use on a sustainable footing, enhancing irrigation productivity, providing water for critical human needs, and providing farmers and communities with more confidence to plan for a future with less water. The implementation of COAG water reforms, the National Water Initiative and the Murray-Darling Basin Agreement necessitated an additional agreement between New South Wales and Queensland. interstate trading of water entitlements. The implementation of the agreement is overseen by the Border Standing Committee whose membership comprises senior officers from the water and environment agencies of both states. The states acknowledge that nothing in the agreement is intended to affect the role, functions and powers of the Border Rivers Commission. The Paroo River agreement between New South Wales and Queensland in 2003 was reached after a joint recognition of the significance of the water resources in the Paroo River system to maintain the unique character of the Paroo catchment. 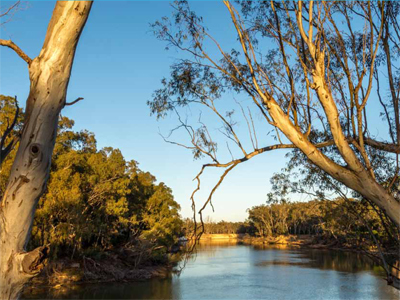 The ecological diversity, economic and spiritual connection values have all been recognised and the Paroo is widely accepted as one of the few unregulated and relatively undeveloped rivers in the Murray-Darling system. The agreement, in place since 2003, provided a useful cross-border strategic water commitment, influencing the substance and nature of subsequent water planning and management decisions for both states. The Paroo River Intergovernmental Agreement put limits on any further water extraction for the river system. The Intergovernmental Agreement on a National Water Initiative (2004) is an agreement between the Commonwealth, New South Wales, Victoria, Queensland, South Australia, the Australian Capital Territory and the Northern Territory governments. The agreement is a shared commitment to increase the efficiency of Australia’s water use, leading to greater certainty for investment and productivity. The Snowy Water Inquiry Outcomes Implementation Deed (SWIOID) 2002 is a legal instrument between the Commonwealth, New South Wales and Victorian governments. The SWIOID gives effect to the outcomes of the public Snowy Water Inquiry in 1998 and the corporatisation of the Snowy Scheme. The deed includes the water recovery targets for the Snowy, Murray and Snowy Montane Rivers Increased Flows programs. responsibilities of Snowy Hydro Limited. Read more about the Snowy River catchment. The Queanbeyan Water Supply Agreement is an agreement between the Australian Capital Territory, the Commonwealth and New South Wales in relation to the supply of water from the Googong Dam Area to the Queanbeyan City. A basin-wide coordinated approach to bore rehabilitation was proposed as part of the Great Artesian Basin Strategic Management Plan 2000, and resulted in the development of the Great Artesian Basin Sustainability Initiative (GABSI) program. This program was delivered in partnership by the Australian, New South Wales, Queensland, South Australia and Northern Territory governments to provide funding support to repair uncontrolled bores. The GABSI came to an end on 30 June 2017 after 17 years.